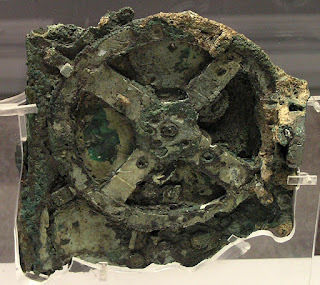 For years the Antikythera mechanism puzzled scientists and archaeologists. This complex ancient computer kept its secret as to its exact nature and purpose. Recently Greek archaeologists concluded that it was a tool for finding out your coordinates in the world, an ancient GPS gadget! Using it, sailors of the 2rd century BC could calculate their coordinates and create accurate navigation maps. Back then there was no Greenwich or equator and the Greek astronomers had established a meridian that passed through the island of Rhodes. This meridian was their “Greenwich” and all other positions of the world were calculated based on their distance from it. According to the scientists the Antikythera mechanism was used measure this distance calculate the global position. In order to calculate the distance the sailor would use the mechanism to find the moon's position in the sky. For example if a ship started a journey from Rhodes to go to Syracuse the sailors would measure the moon's position and set it on the mechanism. While on the journey the sailors would do their moon position “data entry” on the mechanism and calculate their position difference from Rhodes. It was the mechanism that would “output” the position estimate based on their entries. When they would reach Syracuse the would put their final entry and that way that would create a map based on their calculated positions throughout their journey. Pretty neat don't you agree?